Whether you have a big or small business, web designing has now become an essential requirement to achieve success online. An interactive web design has the potential to attract maximum users and get high web traffic. More online users will visit your website, more your products will be admired by customers. In this competitive world of online business, only a good web designing company can help you to make your site creative, easily navigable and successful. A well-planned approach can get you desired outcomes; hence hire iLocal, Inc as your web designer to create a website design with usability in mind. Using creativity approach and technical skills, we deliver results which present day customers would like to see on internet. At iLocal, Inc, we make use of latest tools and techniques which help our web designer to create a site which is fast-running and designed with latest trends. Every website design needs diverse elements to make it look interesting and one of its kind; thus keeping your business in mind; we make use of relevant graphics, call to action and attractive colors in a web design to globally promote your products and generate more and more leads. Choosing a web designing company for creating an innovative website design is a one-time decision. Web design process involves a whole assortment of practical skills, such as designing layouts, content writing, typography and it is only possible with the efforts of a skillful team. We can design a site that not only looks beautiful, but helps you share dynamic content all across the web world. In order to incorporate all these elements in your website design, you need a web designer who knows the basics of web designing and can think strategically as well. Team of web designer at iLocal Inc will help you accomplish your business goals to enhance user participation and get good returns on investment. 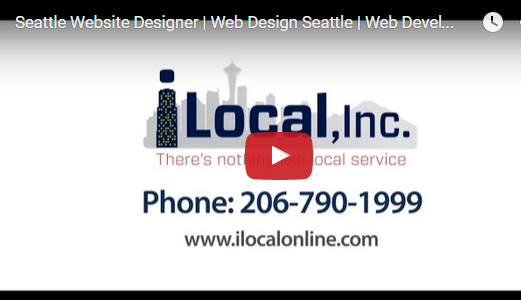 To get creative and professional web designing services to enhance your online business, call iLocal, Inc at 206-790-1999.